This lakefront cabin is a cozy and spacious get away! Decorated by designer John Howell and nick-named The Blue Tree House, you will enjoy many (90% guaranteed) mosquito-free days on the deck and water with the many amenities offered including: large deck with chaise lounges and tables, gas-grill, kayak, paddle boat, floaties, fishing poles, bicycles and pontoon (pontoon not included in cabin rental, but available for weekly rental package). The indoor cabin amenities include: a blue themed décor of chic furniture, fully equipped kitchen with blue pearl granite countertops, large flat screen TV, DVR, DVD collection, internet, stereo sound system, pool table, sauna, games galore, book library, piano, electronic organ, and laundry. Walk to Zorba’s for Tuesday Night Trivia or a blue bobber margarita with your yummy pizza, or Cormorant Store for food and gas is just a 3 minute drive, the famed Detroit Lakes Flea Market is always a hit on Sunday mornings or if you are a golfer, enjoy the Wildflower Golf Course with open prairie lands and oak-lined fairways – just 5 minutes away. 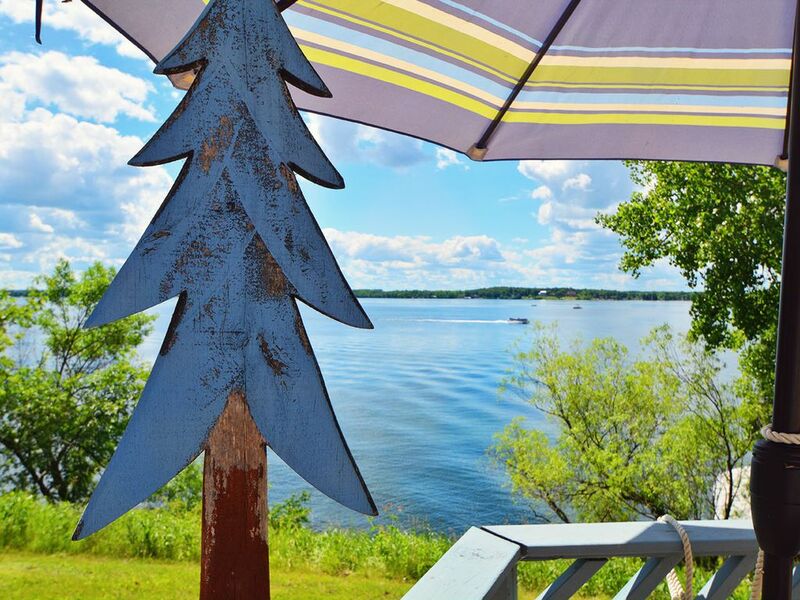 The Blue Tree House provides an ideal place to relax with friends and family while enjoying the beautiful view of Pelican Lake. Come enjoy your vacation in a setting that perfectly blends blue water beauty, nature, and the best of the central lakes area in one package. We spent a week with family over Christmas. The house is roomy and fully stocked. All 10 of us, ranging in age from 9-65, found favorite places to hang out. This ended up being very important because of getting stormed in. After the blizzard, the owners had us quickly dug out. Owners were wonderful to work with. 5 stars from us. This was the perfect house for our vacation! We had a lot of family members coming and going and could accommodate all of them. ESPECIALLY grateful for the piano, since most of us are musicians. The location is perfect, the house is beyond perfect, and the price was outstanding. We'll be back! Lovely property with great views and a huge/wonderful deck overlooking the lake. Cabin has many great places to gather for playing games, talking, relaxing, playing music and eating. Cabin is well equipped with all the essentials for cooking and comfortable sleeping as well as other fun things to do like kayaking, playing croquet, and bike riding. We also had a lot of fun at the pool table and dart board. The location of the cabin is wonderful on Lake Pelican and very near Zorbaz for a dinner and a trivia outing. Very comfortable for sleeping and the AC came in handy on those hot summer days and nights. Pretty much thought of everything--including such niceties and kleenex, q-tips, a bbq grill (the grill needs cleaning) and toilet paper. There were also golf clubs and fishing poles for use. Bottom line--our family had a very nice time and comfortable stay at the "Blue Tree House" and we highly recommend it! The owner was very welcoming and accommodating and made sure we were comfortable!